What was the structure of Middle Eastern states in the Early Modern Period? How did the advent of gunpowder and firearms change Middle Eastern states and Empires? The strength of a military-patronage state is limited by its dependence on the use of force to hold together its empire. Empires such as the Ottomans and the Safavids had the ability to take over huge portions of territory, but the constitution of the state was virtually non-existent, as the ruler of the empire depended on other military leaders to control local areas. These lesser leaders were not loyal to the Shah, or emperor, or his family so the longevity of any ruling dynasty was always in danger of being supplanted by another. Without stability it was impossible for a centralized state to form, especially considering that if a ruler of an empire did live long enough to establish a dynasty, when he died he would divide his empire up amongst his sons. Gunpowder changed everything. The Ottomans were the first of the Middle Eastern empires to harness the power of gunpowder and utilized it to blast open the walls of Constantinople, which ended the Byzantium empire the last remnants of the Romans. This is one of the pivotal moments of world history, as before cannons no army had ever succeeded in overcoming Constantinople’s walls. With the advent of more destructive technology the head of state had advantage over threats to the stability of his regime, both external and internal. Here are all the ingredients for the development of a sophisticated state, where-in security could be provided for the subjects of the empire and thus the state could depend on a regular intake of tax revenue. Aside from new weapons technology, rulers of the Ottoman and Safavids employed Christian slaves for use in their armies and stat bureaucracy. The reasoning behind this was that unlike the lesser military leaders, whose loyalty to the ruling dynasty was in question, slaves taken as children and groomed to fill either military or bureaucratic positions were entirely dependent on the state for their livelihood and for their identity. The Ottomans obtained these warriors, or Janissaries, and bureaucratic servants form Christians in the Balkans, while the Safavids imported slaves from the Caucasus. In 1616 Shah Abbas of the Safavid empire brought back 130,000 Georgian slaves, ghilman, back to Persia and created a 40,000-man army armed with firearms. What was the relationship between Middle Eastern States and Modernizing states During This Period? 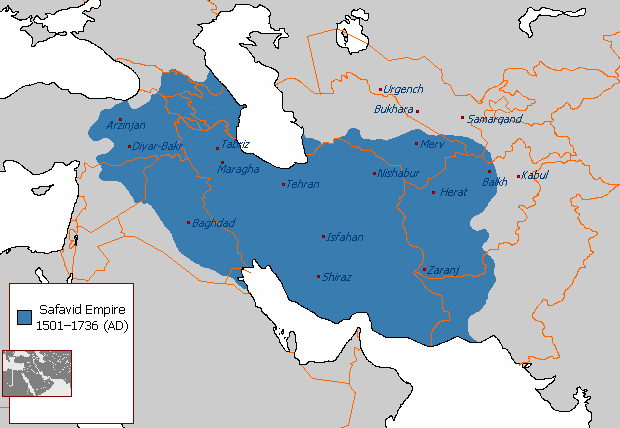 This change in the Safavid and Ottoman empires correlated with the emergence of modern states in Europe. Its significance lay in the stability created and in the sophistication of centralizing state governments. The role of the Shah or Sultan adapted from the military leader at arms to the revered head of state. Still, the role of the head of state of Middle Eastern empires adapted and changed in the corresponding years to modernity; the head of state always at a struggle with the power of society’s elites, in a struggle between the forces of centralization and de-centralization. Before the modern era, the world consisted of a system of world empires. In this system large empires that lived and died by military conquest where largely independent within themselves by provided the resources required of them to operate. While large parts of the world were united militarily under the authority of empire, trade was fragmented. In the system of world empires, states were equivalent to each other in that they were roughly equal technologically and economically. However, around 1500 the system of world empires began to change in the modern world system, a process that took a few centuries. In the modern world system civilization is fragmented politically into nation states while being united economically through trade. People became much more aware of the demands of outside markets and would produce accordingly. Farmers would grow crops not for their own sustainability, but to be sold to a foreign market. Commodity goods such as coffee, sugar, tea, and tobacco would transform world markets. The discovery and exploitation of the Americas attributed to the development of the modern global market. However, the rise of industrialization came to Europe first and, along with the strength of European militaries, was a deciding factor in the role of modernizing states. While in the old system, states of empire were more equivalent, the development of the modern state system led to the economic subjugation of the rest of the world by Europe. The Commercial Revolution in Europe lead to the development of new technologies and institutions that directly benefited trade such as banks, insurance, joint stock companies, etc. The Ottoman and the Safavid empires, still reeling from the economic crisis of the seventeenth century, were dependent on Europe to modernize their states, yet this dependence took away the autonomy and supremacy that they had formerly enjoyed. For example, the local Egyptian government in 1876 wanted to consolidate its power through modernization. Yet this required extensive high interest loans from European banks. Due in part to mismanagement of funds, Egypt found itself to be heavily indebt and in order to not default on its loans, allowed for the establishment of a European-controlled public debt administration. Eventually all of Egypt’s finances were placed under control of the British and the French. James L. Gelvin, The Modern Middle East, 4th Edition. Oxford University Press, 24. Akram F. Khater, Sources in the History of the Modern Middle East, 2nd Edition. Cengage Learning, 40.